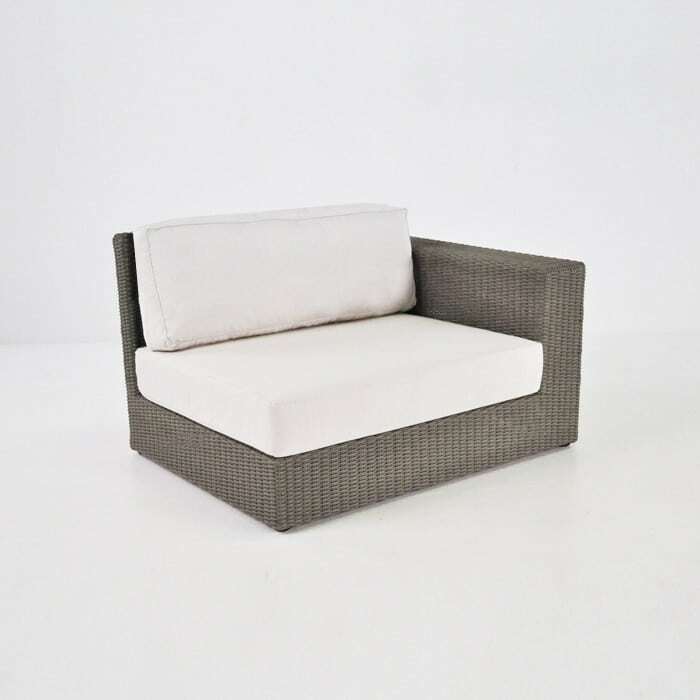 Glorious, grand and generous in size; the Austin Outdoor Wicker Arm Chair in Kubu is the perfect chair for enjoying long, deserved hours of relaxation. The entire Austin Collection is satisfying. Both simple and eye catching; this whole suite is confident and makes an impact either in a grouping or sold in single pieces. Redesigned with a smaller weave and new colour is the Austin Outdoor Wicker Arm Chair in Kubu – our grandest collection of deep seating. The The Austin Collection comes with sectional or fixed options in an ultimately contemporary, spacious design. The ultimate in grandeur, the Austin set features a squared-off design with large arm rests. 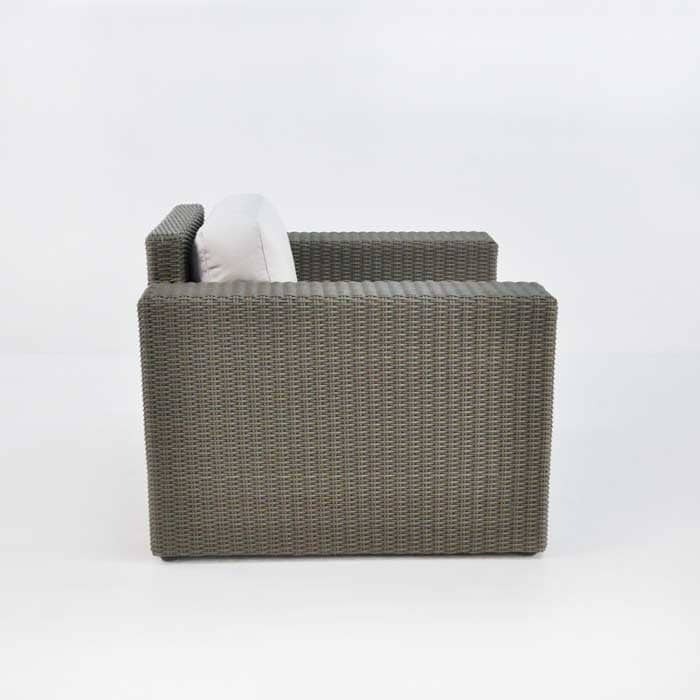 These abundant pieces are constructed from Viro® wicker and are polished off with free Sunbrella® cushions. 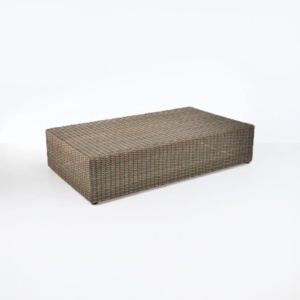 Shown with Canvas cushions; we also have them in Taupe. 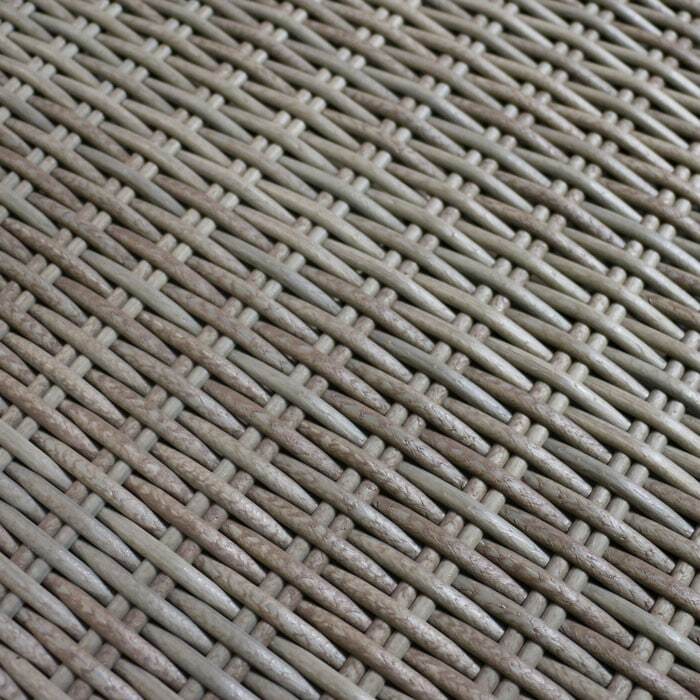 Viro® wicker is our main supplier of All Weather Wicker, through dyed and UV treated to cope with the changing seasons, its unique blend of fibres which make a long lasting and beautifully feeling product. 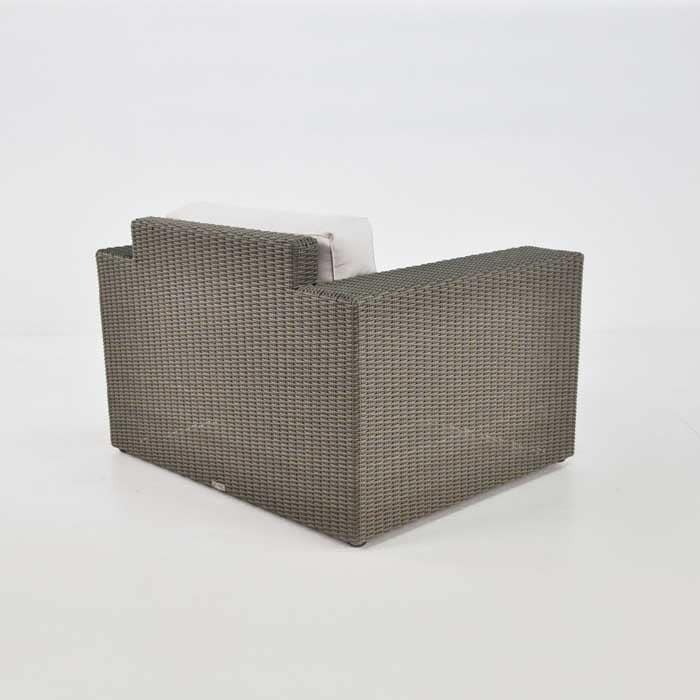 The Austin Outdoor Wicker Arm Chair in Kubu is dressed with Sunbrella® cushions filled with QuickDry® foam and coloured in either Taupe or Canvas, so you may customize to suit your space. These comfortable, soft and luxurious cushions are resistant to fading, morphing or moulding, you can even leave them out in the rain from time to time! Unless it is day after day of torrential rain, these cushions have a unique fibre that will dry out. And they are incredibly easy to maintain. Either spot clean with minor spills or unzip and put in the wash if they get dirty. 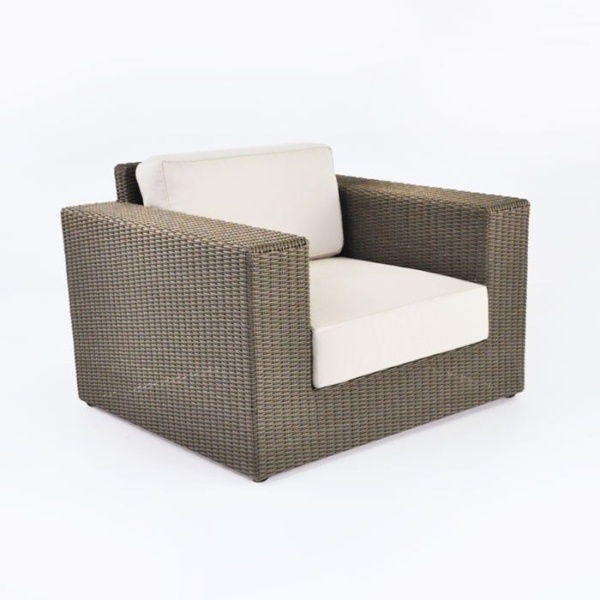 The Austin Outdoor Wicker Arm Chair in Kubu is a fantastic 120 by 90 centimeters, featuring a chunky frame and wide arm – perfect for resting drinks on. 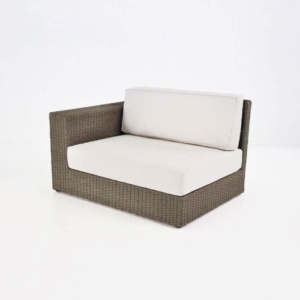 Along with these exquisite long lasting materials, we have tons of other options for beautiful deep seating, dining sets, relaxing chairs, loungers, umbrellas, pots and planters. Look into our items made from Grade A Teak, Raw Concrete, Powder Coated Aluminium, Ecolene, Rehau, Woven Plus, Reclaimed Teak, Batyline® mesh and Stainless Steel. The Austin Outdoor Wicker Arm Chair in Kubu can be set on its own in a quiet corner specifically for you to curl up with a book and a cup of tea on a lazy Sunday morning, or added to a larger collection for a grand deep seating set. 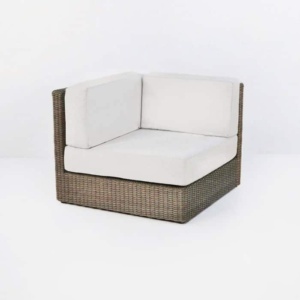 Imagine your backyard, paved with brick or stone, a few candles flickering away in outdoor votives or hurricane lamps… now import yourself and your best friends into that setting in 3 of the Austin Outdoor Wicker Arm Chair in Kubu with a 3 Seater, 2 Seater and low Reclaimed Teak Coffee Table. Put a couple of Rectangular Planters around the space in diffused Raw Concrete and you will have created a contemporary haven of goodness in the security of your own home. These Austin Outdoor Wicker Arm Chairs in Kubu are also an inspired choice for an apartment balcony, fitting in with the surrounding architecture while making the space more your own. 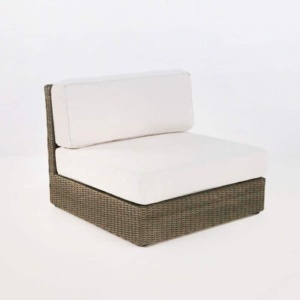 The Austin Outdoor Wicker Arm Chair in Kubu is a chunky and charming choice for your home.